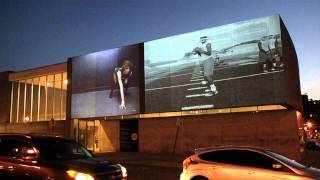 CAM’s large-scale video art series, Street Views, is on view every evening from dusk to midnight, projected on the Museum’s front facade. This fall, two short films by Virginia-based artist Kevin Jerome Everson explore different interpretations of American football. Projected at a monumental scale, they find the beauty inherent in everyday actions, creating moving portraits that reveal poetry and meaning within the mundane. Across his more than 100 feature-length and short films, Everson interweaves intimate narratives with formal aesthetic rigor to create poignant accounts of daily events and the people who experience them, often blurring the line between documentary and fiction, combining the “real” with the staged and scripted. Everson’s subject matter most often focuses on the physical and social surroundings of working-class African Americans and others of African descent. In the first, Tygers (2014), members of a high school football team engage in practice drills. By interspersing sequences of controlled movement with pauses, Everson emphasizes the discipline and concentration underlying the athletes’ seemingly mechanical gestures. The camera’s close positioning to the boys and the way in which they stare directly into the lens establish a sense of intimacy and vulnerability. In The Release (2013), professional dancers enact a classic football gesture as a rhythmic dance. Intentionally slowing down the speed of 16mm film, Everson divorces the moves from their original functionality, revealing their engagement with the entire body and surrounding environment. Drawing connections between athletics and performance, the film foregrounds the art inherent in sport. Kevin Jerome Everson (b. 1965, Mansfield, Ohio) is a Professor of Art at the University of Virginia, Charlottesville. His paintings, sculptures, photographs, and films have been exhibited at numerous art institutions and museums, including the Museum of Modern Art, New York; Centre Pompidou, Paris; Whitechapel Gallery, London; REDCAT, Los Angeles; The UCLA Hammer Museum, Los Angeles; American Academy of Rome, Rome, Italy; Wurttenbergischer Kunstverein, Stuttgart; and The Wexner Center of the Arts, Columbus, Ohio. His work was featured in the 2008 and 2012 Whitney Biennials and the 2013 Sharjah Biennial. Kevin Jerome Everson is organized for the Contemporary Art Museum St. Louis by Kelly Shindler, Associate Curator. Special thanks to Pulitzer Arts Foundation and Madeleine Molyneaux.